Als u een Picoscope Automtive oscilloscoop koopt krijgt u industrie leidende eigenschappen die zowel makkelijk als betaalbaar is. Pico automotive oscilloscopen combineren de performance en opties die u zou verwachten van de martkleider in PC scopen technologie, Alles in een makkelijk te gebruiken en betaalbare behuizing. Unlike most digital storage oscilloscopes, which typically have 8-bit vertical resolution and poor DC accuracy, Pico automotive oscilloscopes are accurate to 1% and have 12-bit resolution. This gives a vertical resolution of 4000 ‘dots’ compared to the usual 100 or 200 of most other automotive scopes. As well as the high vertical resolution, Pico automotive oscilloscopes also feature large memory buffers – making it possible for you to capture large, complex signals and then expand areas of interest to show the fine detail of the signal. 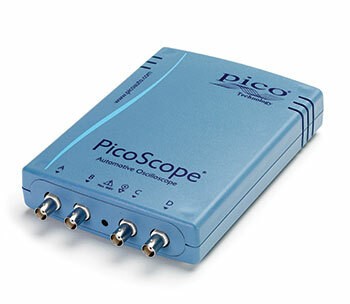 PicoScope automotive oscilloscopes are specifically designed for use only in automotive applications. With features such as high resolution and accuracy, a large memory buffer, and a high-speed USB connection, PicoScope automotive oscilloscopes offer unrivalled performance, and are suitable for use in the most demanding automotive applications. You can purchase a PicoScope automotive oscilloscope on its own, or as part of an Automotive Diagnostics Kit. These simple to use kits contain everything you need to turn your PC into a powerful automotive diagnostic tool. As well as capturing faster signals, the PicoScope 4000 series also outperforms other scopes thanks to the 32 MB of ‘always on’ memory. With 64 times the memory of the previous generation of scopes, the PicoScope 4000 series ensures that you can effortlessly capture every detail of the signal. Never again will you miss those hard–to–find intermittent faults. The high ±100 V input range of the PicoScope 4000 series eliminates the need for external attenuators for most vehicle tests. Thanks to the familiar graphical user interface, help files and reference library, using your PicoScope 4000 series diagnostic oscilloscope is as easy as ever. If you’re an existing PicoScope user you can just connect your scope and benefit immediately from the power and performance of your new PicoScope 4000 series. If you’ve never used a PicoScope oscilloscope before you can get started without needing to spend hours reading manuals. The fast sampling speeds, large memory and bandwidth of the PicoScope 4000 series means that not only is it suitable for use on all current vehicles, but it will continue to be of use in diagnosing faults with the complex electrical and electronic systems that will be found on new and future generations of vehicles.